Not enough coverage, and not much selection. A pretty good powder overall. I use it to set my concealer and foundation--because of my acne, powder alone isn't really an option. I have very oily skin and it didn't really help with oil-control, but I have yet to find a powder or foundation of any kind that does. 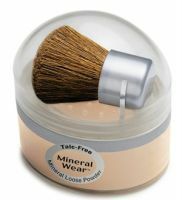 However, it does look really nice, and the loose powder looks nice and natural compared to the sponge and cake-powders. The color is ...read morenice. The brush it comes with is a little scratchy but it will do if you don't have anything else. I'd recommend getting a better/bigger brush. And the packaging isn't perfect and not good for throwing in your purse. However, definitely good to have in your makeup arsenal! In terms of value/quality, it's just as good as bare minerals in my opinion. I had a free sample of bare minerals that I tried for a few days and I prefer Physician's Formula--bare minerals made my face itchy, and Physician's Formula didn't, which is interesting because my skin is not sensitive at all! The coverage and oil-control power of the two was equal. And PF is much more affordable, and has TONS of product that will last you a long long time. If you use powder at home, a good buy! This product made my skin look pretty bad. Starting with the product itself, it went on really heavy but provided inadequate coverage. While the I did manage to find my shade, it didn't really matter because it looked rather chalky once on-- it looked several shades lighter on my skin than it did in the package. I think maybe it wasn't meant for darker skin tones because it looks lovely on my frie...read morend who is super pale. Now, about the packaging... it was bad. It isn't convenient to carry around because it's messy, bulky, and awkward. The included brush is mediocre and I ended up throwing it out and using my own brushes. The upside to this product is that you get a lot for the price so if you are pale try this out, if not you'd better skip it.